If there’s anything the Trump presidency should have taught people in the opinion business, it is to pause before overreacting in the short term. As such, I will temporarily shelve my gut response to the arrangement that has been made to re-open the government. I’ve spent the last few weeks warning that the Democrat lure—“Re-open the government, and then we’ll really, really negotiate in good faith”—is a trap that should be ignored. But then I’ve spent the last two years trusting that the President knows what he’s doing, an assumption that has held up well in most cases. I deployed it this week as he agreed to delay the State of the Union address, figuring he was engaged in the psychology of brief acquiescence in order to push even harder at the border bargaining table. Well, apparently not just yet. 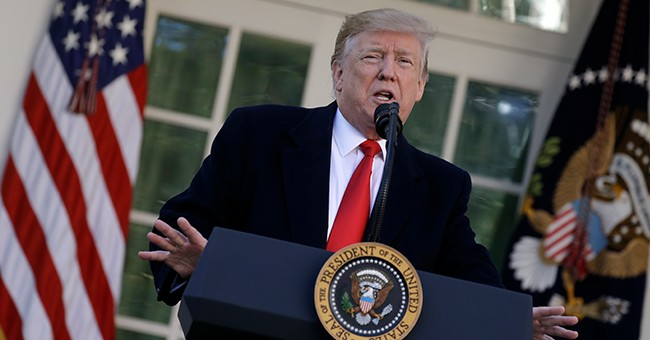 The President Friday agreed to a temporary funding measure that sends the suffering furloughed federal employees back to work, and he did it without receiving a dime of wall funding. Social media exploded with characterizations of this as caving under pressure. Some were the laments of frustrated Trump supporters; others were the gleeful smirks of his detractors. It would be wise for both groups to take a breath. His critics are thrilled to see an example of surrender; some in his base are mortified. Across that landscape, a question should arise: Does everybody think he has lost his passion for wall funding? Do we really believe that after years of railing so hard on this signature issue, that he is going allow himself to get owned by Nancy Pelosi? There must be a plan here. We just don’t know what it is. I don’t know that the plan is smart. I don’t know that the plan will work. But I would bet that we’ll know a lot more in three weeks than we know now, and some of today’s tweets may not age well. This puts them back to work, freeing up media time to cover the actual negotiations. If those are as futile as some (like me) believe them to be, we will wind up right back at square one on February 15. One of the reasons I warned against re-opening the government is that it would invite a second cathartic shutdown countdown and a second wave of media panic that would bring the whole thing back to the front of the public mind. Admit it; the shutdown was losing stigma every day. That added pressure on Democrats to yield on the border dollars since they didn’t really have a strong shutdown-angst card to play. Maybe that was about to change. The Friday stories of airport delays rippling across the Northeast may have been a signal of harsher shutdown consequences on the horizon. Average Americans were not doubled over with shutdown anxiety so far, but wait until every newscast led with families with screaming kids stranded at the airport because they can’t get to Grandma’s in New Jersey. That won’t happen now, and there may be benefits to that. But down the road, today’s give needs to be balanced with a whole lot of take. The willingness to open the government had better not come with willingness to buckle on the kind of border security millions of Trump voters are counting on. A re-opened government does not exactly leave Democrats stung by immediate Art-of-the-Deal brilliance. They may well dig in harder now, joining some crestfallen Trump supporters in the belief that he has been worn down. It might be wise to put a pin in that and see what mid-February brings. Expect the next three weeks to be filled with more of the familiar rhetoric of both sides: the President insisting on a wall, the Democrats mocking it. His enemies will squeal, his fan base will say all is forgiven, and then the whole battle moves to the courts. That’s only one of several possibilities, but it seems more likely than the knee-jerk reaction that his spine has liquefied. So as the news sinks in of today’s seeming concession, review the last two years and its long list of stories that have changed over three days, or even three hours. Three weeks is an eternity.